So, for this week’s collection of odds and ends. 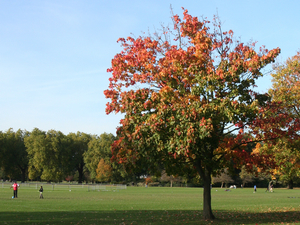 This week’s photo doesn’t really have any artistic merit – composition and exposure could be better – but it is from Battersea Park where autumn is making itself known. The park really is beautiful at this time of year, and almost magical if you see the early morning mist, and that attracts me to the photo. I’ve become an unlikely cycling enthusiast this week, surprising even myself by my desire to use the bike following last week’s training. It has, so far, been an interesting experience and one that really validates the purpose of the scheme – empathy is all well and good, but putting yourself in the position is much better. I intend to write a little about it as time progresses. But it also makes me think I need to look out for more opportunities to try new things for myself. The Local Strategic Partnership (LSP) is the partnership of partnerships in Wandsworth. It has members from the council, police, health service, business and voluntary sectors and it responsible for the high level direction Wandsworth takes. I was first made a member in 2006 (after a short period as a deputy member) and will not deny that it was not my favourite meeting. However, shortly after I joined the membership was changed and the meetings became far more productive and far more harmonious. I hope that will show in the Corporate Area Assessment report when published. The second cycling meeting. And not a terribly interesting one. Most of the evening was consensual. The only real debate was over aircraft noise and Heathrow expansion (something the council has long campaigned against). Even there the Labour Party agreed with us, but then somehow voted against. So they support campaigns against airport expansion, but don’t. I confess I don’t understand the logic, but as long as they can justify it to the electorate I suppose that’s what matters. Tuesday saw the first meeting of the Nine Elms Opportunity Board (with the great acronym NEOB). Actually the body has existed for a long time under the name Power Station Opportunity Board but has recently been expanded to include more of the major developers from the Nine Elms area. NEOB’s role is to make sure we get all we can out of the area, not only in terms of development, but also in opportunities for local residents. It is an incredibly exciting time for the area, which is central London’s largest opportunity zone and things are, hopefully, finally starting to move. The US Embassy’s decision may have been a major coup, but New Covent Garden Market are starting consulting on their redevelopment and the Power Station put in their planning application (which fill two large chests) last week. I can’t wait to see how things develop. And finally last night saw a celebration of Maurice Heaster’s forty years on Wandsworth Council. Although being a councillor, and especially a Cabinet Member, is increasingly becoming a ‘paid job’, for over thirty of those forty years Maurice was effectively a volunteer so it really is no mean achievement to have dedicated so much of one’s life to the council and community. It was a really good celebration of everything he has done, both on the council and outside and a pleasure to attend. It was particularly pleasing to see both parties there (even if Tony Belton was, for many people, far too pointedly political in some of his comments) recognising that, despite differences, public service is still something to celebrate.